Max Watman’s new book brought me back to fifth grade when my friend Debbie gave me half her chicken sandwich and I found a vein in it. “What’s this?” I asked her when I saw the tiny purple tube protruding from the chicken meat nestled between two pieces of her mother’s homemade bread. She shook her head even though she was no longer surprised at all the things a transplant from the suburbs of Connecticut to the White Mountains of New Hampshire didn’t know, and she explained. It was the first time I connected chicken with a formerly live animal, probably one I’d seen clucking around in her mother’s coop the week before when I helped Debbie collect eggs. Until then, I associated poultry with what came sealed in plastic wrap at the meat counter when my mother took me shopping. I wanted to put the sandwich down but I was hungry and embarrassed, so I pulled out the vein, closed my eyes and chomped. I don’t remember if it tasted much different from a “store-bought” chicken but I finished it. In the decades since moving from northern New Hampshire, I’ve consumed flocks of chicken but few have had any remaining veins and most have come from places that sickened me when I saw them exposed on movies like Food Inc. 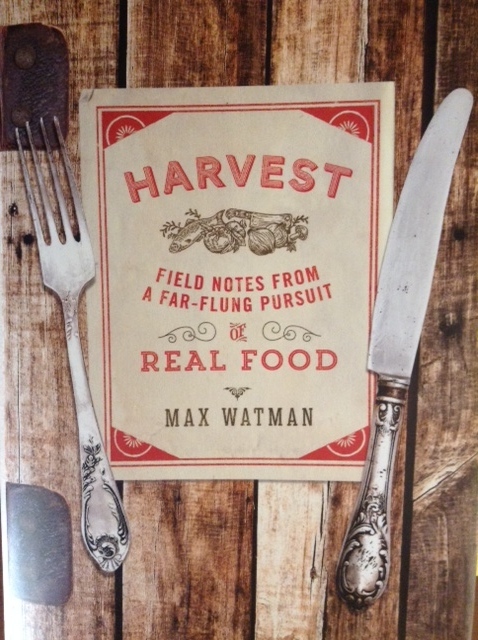 In his book Harvest, Field Notes From a Far-Flung Pursuit of Real Food, Max Watman writes of his efforts to to get as close to his food supply as he can without being a farmer. I started it because it was a gift from The Distiller who is his friend. I finished it because it made me laugh, wince, and begin to see a way to make friends with food again. I am in the middle of a crisis when it comes to my relationship with food. The erosion of my faith in the food industry has converged with some health issues and lately I analyze benefits versus risk every time I take a bite of something I used to love unreservedly. Tomatoes. Eggplant (nightshade vegetables with inflammatory properties) Fresh peaches (pesticides). Fried peppers and provolone on crusty Italian semolina bread (nightshade, dairy and wheat gluten). Chicken, hamburgers or, increasingly, any meat at all (raised in inhumane conditions and unresolved issues about eating animals when I could thrive on alternatives). My mental gyrations are those of a privileged person — one who has never known hunger or been deprived of basic sustenance by factors outside my control. I am grateful which gives rise to shame when I get lost in the dilemma of what to eat. This doesn’t make the food go down any easier. Watman, on the other hand, is passionate about food. He comes from foodie roots; He was hooked on cooking at nine when he roasted a chicken for his ailing parents who were among the first “locavores.” He’s also a writer, which means he is curious and observant, not afraid to dig deep into a subject or look inward if his journey takes him there. He reads. He tries things. The first half of “Harvest” takes us through his attempts to find “purity and quality, simplicity and grace” the elements that would make the food he serves friends and family better, to live, as he says later on, “as if I were on a farm but without the farm.” We meet Bubbles the steer he purchases and lets fatten on a Virgina farm while he introduces us to his chickens, “the girls,” his cheese-making efforts, the hunting, the fishing, and, of course, the garden. Nothing quite goes as planned which, combined with the literature he’d absorbed without quite wanting to, brought him to a crisis in his neighborhood pizza joint. He stared at the familiar menu, utterly unable to think of a single thing he wanted to eat there and believed he had failed. The crisis nearly becomes a writer’s crisis until Watman’s wife, Rachel, points out that amid the failures were successes, thriving like volunteer tomatoes amid his disappointments. It’s a good thing too because the moment in the pizza joint leads to a mouth-watering description of a pizza that he goes home and makes himself. He made fresh mozzarella, his own pizza dough — slowly fermented to help his wife digest the wheat — and heated sauce he’d made from tomatoes he’d grown. These moments when Watman discovers what his search, and his book, are really about kept me turning the pages when I should have been writing, packing for a trip, and about a thousand other things that will hammer me at 3 a.m. tomorrow when I can’t sleep. What the pursuit of real food comes down to, Watman shows us, is deciding how we will participate in bringing the food we eat to table. His well-told stories of his own experiences — and the meals along the way — show that even those of us who will never be farmers or hunters or fishermen can do more that we think, have fun doing it, and gain a little balance and wisdom in the process. And let me know if you’ve been reading any books that make you think differently about food! Eating well for myself and eating responsibly for the sake of the world’s health can be expensive and controversial. I’m ashamed of how I recently put a good friend on the spot after she said she would prefer to save money than buy from local farmers. Nonetheless, talking about what we eat and the choices we make about the way we spend money is important. I personally need to do a better job of it. Betsy’s column, so well written, gets into the way our heads worry us about food. I really like this. Betsy, you have such a delightful voice. This post was a pleasure to read, as are they all. I’ll have to “Harvest” now. I did read Michael Pollan’s “The Botany of Desire” a couple of months ago, and that was a real eye-opener. I will never again eat a non-organic potato! Fortunately, there’s a great Farmer’s market down the road every week, loaded with organic produce — including potatoes. And my garden, also organic, is doing great. I’m swimming in tomatoes, green beans, and squash. A neighbor and I are thinking of getting chickens, too. A true locavore, that’s me! If you haven’t read Pollan’s book, it’s well worth it. You’ll never look at certain foods — or our relationship with plants — the same again. Well, I did not eat chicken from the age of 15 to about 34 after being a short order cook for 6 months when I had just turned 15. I am still skeptical so I enjoyed this review. Betsy, I love the first line of your essay! I’ve gone through very similar contortions over the last few years about what to eat. The book that changed my life was The Food Revolution by John Robbins, which I’ve given to every person in my life who’s the least bit open to reading it. Well researched, calm, and utterly persuasive — both on the nutrition front and the practical/ecological/philosophical side. I highly recommend it. (And now I will definitely buy this book, too!) Reading Robbins about five years ago was the moment when it felt as if I turned my own brain back on, shining a light on all the stuff I sort of knew but didn’t want to think about when it came to my own diet. Since then, it’s been easy not to eat meat, to shop differently, to cook differently, to consider the farmers at the farmers market as dear friends who deserve all the support and encouragement we can give them. A very personal journey, to be sure, but I love knowing you’re a fellow traveler on this path. There’s much more I could do, but compassion for myself is as much a part of this adventure as any hard and fast rules. Five years in, I feel healthier and much more intuitive about what’s good for me (and for the planet). Thanks for the lovely review of this book; it sounds great.